The Philadelphia Inquirer published my review of The Letters Ernest Hemingway, 1926-1929, today. 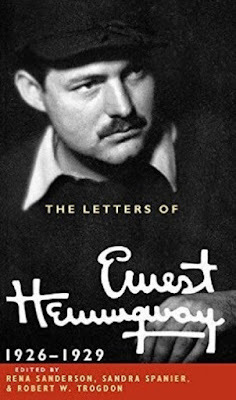 Perhaps no 20th-century writer has had a greater influence than Ernest Hemingway. His novels, short stories, and journalism are penetrating and iconic; his personal life, thinly veiled in his fiction, was the stuff of drama and romance. Hemingway was rich, famous, and beloved by millions of readers worldwide. He had the freedom to live and travel anywhere he wanted, and he hunted and fished around the world. As a writer, he covered wars, crime, sports, and any subject that interested him. Although his life ended in suicide, he otherwise led what was for many the quintessential writer's life. 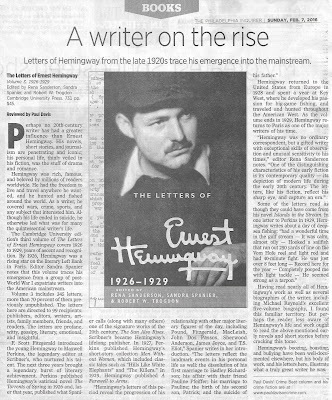 The Cambridge University edition's third volume of The Letters of Ernest Hemingway covers 1926 to 1929, years of ascent and recognition. By 1926, Hemingway was a rising star on the literary Left Bank in Paris. Editor Sandra Spanier notes that this volume traces his emergence from a group of post-World War I expatriate writers into the American mainstream. ... "Hemingway was no ordinary correspondent, but a gifted writer with exceptional skills of observation and unusual sensitivity to his times," editor Rena Sanderson notes. "One of the distinguishing characteristics of his early fiction is its contemporary quality - its depiction of modern life during the early 20th century. The letters, like his fiction, reflect his sharp eye, and capture an era."